Solis Ortus will have its OPENDAY on Saturday, 19 January 2019. We envision this event to be as inspirational as 2018 and stand proud how we projects karate as a life sport but also as a lifestyle. Solis Ortus is a well-known, proud karate club with a rich history. We have celebrated our 40th birthday in 2018 and have accomplished our 80th successful grading on 1 December 2018. It is amazing to see how our parents’ family values blend in with the way we teach karate to our students. As a responsible parent we teach our kids to respond to their ability which defines responsibility; to be respectful to yourself and others, to always tell the truth and be sincere in everything, to always do things right, put effort in what you do, and to have self-control. All these principles form the basis in all human beings which defines their character, a person’s essential qualities. That is the 5 basic principles in life, but also the 5 basic principles in karate. How awesome is that? You train your brain and get a full body conditioning session with it. Although karate is a good overall body workout, there is also a lot of philosophy and precepts around it which forms the foundation of the art. The principles allude to notions of humility, respect, compassion, patience, and both an inward and outward calmness. Many karate students excel in school as they stand out above the other kids with better concentration, focus capabilities, self-confidence and solving challenges. These qualities ensured better academic results, leadership, better friendships and of course a healthy lifestyle. Solis Ortus strives to be the extension from home in a sporty environment. Many of our students excel not only in karate as a sport, but also on a personal level. Karate can be an additional sport towards a sport you are currently doing. Karate can be a family sport, it doesn’t matter how old you are. Karate can be a lifestyle or can be competitive….your choice. Karate takes time, but so does anything that is worthwhile. Karate is FUN, rewarding and challenging. Many adults also start karate as a sport. It is an incredible stress reliever. It has unbelievable health benefits. Karate increases your flexibility, balance, hand-eye coordination and your natural strength without weights. Building strength without weights decrease the risk of injuries. Karate uses principles of isometrics and plyometrics to increase natural strength and power. It prolongs your fitness levels. The long term health benefits of a proper karate program is immeasurable as it is not uncommon to see excellent karate students practicing well into their 70’s or even their 80’s! How is that for motivation? 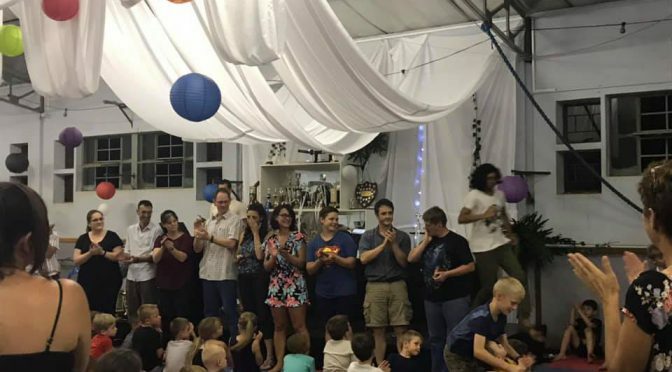 Above being a Karateka/student, Solis Ortus rewards everyone by grading twice a year to achieve their higher belts and become the best karateka they can be. Karatekas are well mannered and have immaculate etiquette, and therefore excel in society. You are invited to our open day to experience these principles first hand. Come and enjoy the morning with us…. With prize giving done and dusted, the holiday season begins. For some it means the amount of time left for working in 2018 is minimal. We find this to be a great time of reflection on the events of the year so far. For Solis Ortus, it has come with many accomplishments, surprises and the year turned out to be the highlight of our 40 year celebration. Happily, some of us experienced few disappointments but without disappointments there are no learning curve. Prize giving at Solis Ortus is a big event. It is a prestigious event to acknowledge and recognise our karatekas for their accomplishments. Accomplishments in tournaments, but also for those who are doing karate for enjoyment and or lifestyle. What a year we have had at Solis Ortus. To spice up our prize giving function, we invited two karatekas, who not only excel in karate, but also as “artists” outside karate. Our own drummer boy Wihan Vermeulen, who was recently awarded the highest mark in a Level 1 Rock school Exam for drumming in South Africa with 96 percent, had our audience clapping along to a Justin Timberlake song. This Red Belt drumming sensation (age 11) is set to take Pretoria by storm. To uplift our evening, we also had a WX Street and Hip-Hop dancer. This talented lady is a 16 year old junior brown 1 belt, Roanne Koudstaal. kykNET presented an all styles dance competition, and Roannes’ dance group won best hip-hip dance group in South Africa. This event will also be broadcasted on kykNET January 2019. She also excelled as a karateka and have won JKA Nationals twice in kata and kumite. Solis Ortus has more hidden talents and we would like to hear more from them. 2018 Delivered four Protea colour members; PW Pentz, Thirq du Preez, Hannelore Constable and Savannah Hauser. What an honour and accomplishment. 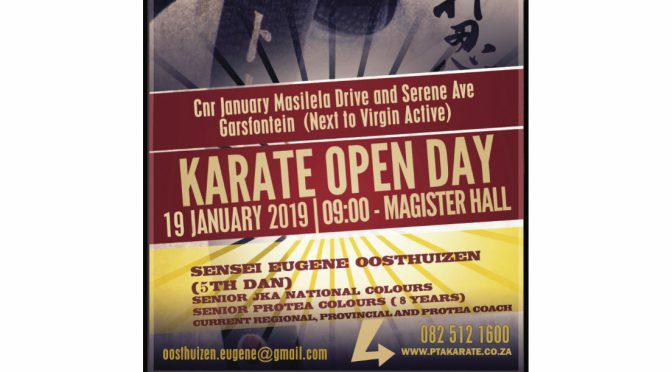 Their achievements are an inspiration to other karatekas of the dojo and Solis Ortus cannot wait to see who will achieve their Protea colours next year. This past year, we had 88 medallists who received a total of 299 medals in all tournaments participated. A total of 202 KSA and JKA colours were achieved. Solis Ortus is so proud of each and every one of you. At prize giving we also acknowledged our karatekas whom do not compete in tournaments. Most of them were awarded with the 5 maxims of karate, perseverance, loyalty, good progress and best grader. Other floating trophies awarded were Best Kata, Best Kumite, Veteran of the Year and Karateka Male/Female of the Year. Congratulations to all our karatekas who have been awarded. Thank you to all our children, juniors and seniors who make karate a blessing to teach. Thank you to your little smiles, your love and appreciation. Thank you for being part in building a rich karate history with Solis Ortus. Thank you to our parents who are always willing to turn up for classes, for your dedication and encouragement and of course your participation in all Solis Ortus events. Without you, we can never be such a successful club. Thank you…. thank you! Solis Ortus also had to say goodbye to one of our beloved Instructors, Lilian Mynhardt. She taught our kids for the past 10 years and saw many of our kids becoming higher belts and black belts. Her contribution to Solis Ortus is unmeasurable and words cannot describe what she has done for the club, kids and parents. It was a sad moment for everyone. To give her appreciation of all her hard work, love, sweat and tears, the whole hall gave her a standing ovation. What a breath-taking moment. We salute you Lilian Mynhardt and wishing you all the success for your new journey. Reflecting on the year that has been, it is a great way to access new experiences and hold onto learnings we have picked up. Now that we conclude 2018, Solis Ortus wishing you a fantastic festive season. If you are travelling, drive safely. 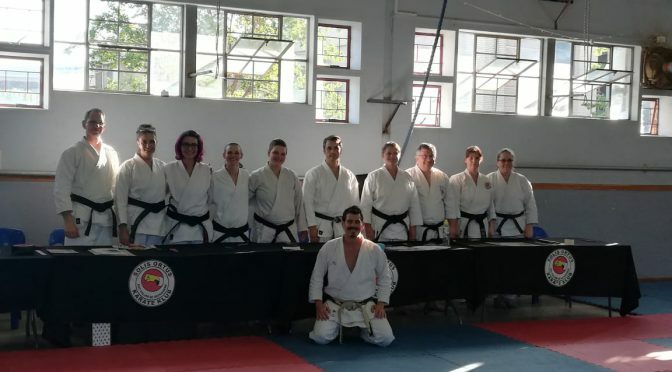 Solis Ortus had their 80th Grading on Saturday, 1 December 2018. Traditionally, Solis Ortus always starts with the Minis graders. Too cute for words they conquered the morning with loud kiai’s, precision and incredible spirit. The mini grading is always a good introduction to the rest of the days’ events. We adore the minis; each one equipped in their own right with the 5 maxims of karate. We are so proud of each and every one of you. The rest of our grading day was per belt and age group succeeding to higher belts. The standard was high. Some students experienced grading for the first time. For them it was more intense and stressful. For our more experienced grading students, stress will always be a factor, but their experience pulled them through. Like they say, the harder you work the luckier you get. In this case the harder you have worked the easier it will be. To all our 80th graders of Solis Ortus. Well done. Our panels in kata, kumite and kihon congratulate you all in a successful grading. You have grown so much as karatekas. Some of us improved a lot and others just excelled in their karate. It is amazing to see how each karateka in their own character have excelled as a person. Some have shown more leadership, others improved in their school work or workplace, most of us learnt how to handle our stress levels and everybody showed the joy they experienced in their karate. To our more senior group, not in belts, but in years…..well done. Grading is not for the weak. You all have conquered your fear and spread your wings to successfully graded to your next belt. To our senior belts, not in age…what a fantastic grading. It is amazing to have seen you grow from white to where you are now. WELL DONE…FANTASTIC…keep up the standard! Sensei Eugene and the grading panel are extremely proud of you all. Wear your belt with pride, frame your certificate, hang all your medals, but most of all be an ambassador wherever you may go. Keep on training, work hard and excel in life. Well done to everyone, relax and we cannot wait to see you all at prize giving 7 December 2018.